Conrad Parlanti (known as Dino) was the eldest child of Ercole Parlanti, and was born in 1903 in Fulham, London. He worked in Ercole’s foundry as a youngster, and was a director of E.J.Parlanti & Co. Ltd. before starting a number of different companies, some more successful than others. A work colleague described Conrad as a brilliant caster but a poor businessman. As demand for bronzes reduced, Conrad branched out into other areas. In 1929 Conrad owned a foundry in Teddington, Middlesex which produced not only bronzes, but also worked in copper, lead and glass. Towards the end of WWII, Conrad had an idea as to how to ring in the peace. Whilst driving to a meeting, he saw a pile of aluminium ingots in a field. Conrad enquired after them, and was told that they had been cast from German aircraft shot down over the United Kingdom. This led Conrad to develop the Victory Bell. Originally designed with an open V handle so that a chain of people could be formed by one bell being held and rung by two people, he decided that the cost of casting this model would prohibit many people from purchasing one and therefore settled on the design that is most commonly seen today (pictured below left). The Victory Bell caries motifs of Churchill, Roosevelt and Stalin with a V on the one piece handle. The bells sold for one pound each with all the money going to the RAF benevolent fund. 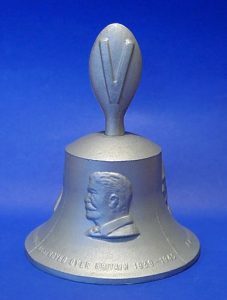 Conrad later made a mould for some larger bells of the same design and invited as many as possible of the Battle of Britain boys to come to the foundry and cast a bell. These larger bells were auctioned off at the Hungaria restaurant in London by Flanagan and Allen to famous people attending the gala. One bell sold for one thousand two hundred pounds. In 1950 Conrad decided to set up a bronze foundry in Ireland, the idea being to manufacture bronze leprechauns for export primarily to the USA. Conrad wanted to set the company up to be run solely by the Irish after initially bringing over craftsmen from his foundry in Herne Bay, Kent to train Irish workers. 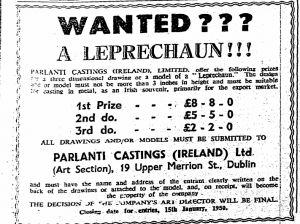 An advertisement was taken out in The Irish Times stating ‘Wanted??? A Leprechaun!! !’ inviting designs and or models for his venture, with a first prize of eight pounds and eight shillings for the winning design. After receiving about seventy models and one hundred drawings, it was decided that the winner would also almost certainly receive a royalty based on sales. Unfortunately, due to bad management, the company went into voluntary liquidation, defaulting on a loan given by the Irish government. In 1952, the Carron Company of Falkirk, Scotland showed an interest in the Herne Bay foundry along with a number of patents that Conrad had registered. Carron purchased a controlling interest and Carron Parlanti Limited was formed, making Niforge castings in aluminium, iron and steel by the Parlanti Mould Process for aircraft and radar systems. The Parlanti Casting Process was designed by Conrad. 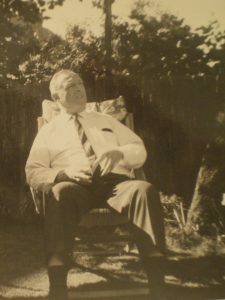 Conrad emigrated to the USA in 1955, settling at first on the East coast and working with General Communications in Boston, later with Gorham Silver of Providence. He was awarded the degrees of D.Sc. and Ph.D. from Bari University in Italy in 1957. 1962 saw Conrad become a naturalised USA citizen whilst living in Massachusetts. Conrad finally settled on the West coast. In keeping with his character, Conrad continued to develop further business interests, which included infrared photography, and was even patenting designs as late as 1981. Conrad worked right up to his death in 1984. Having worked since a young man in foundries, a difficult, dirty and physical job, he was able to pass on good advice. ‘Never’ he said ‘lift anything heavier than a pen to earn a living’. Conrad’s daughter, Theodora Parlanti, was a talented artist. In 1959 she was elected a Fellow of The Royal Society of Arts in London for her work in the fields of oil painting and interior design.